Wilmington OEM first responders with JW Fishers side scan, Inset – European military officers with Fishers sonar. Many fire and police departments consider side scan sonar an essential piece of dive team equipment as it produces detailed images of the underwater environment regardless of water clarity. In addition, the sonar is able to search large areas quickly, scanning several hundred feet of ocean, lake, or river bottom with each pass of the boat. The acoustic beam reflects off any objects lying there and the data is sent topside where vivid color images are displayed and stored on a laptop computer. Side scan can easily locate a variety of targets including sunken boats, submerged vehicles and drowning victims. 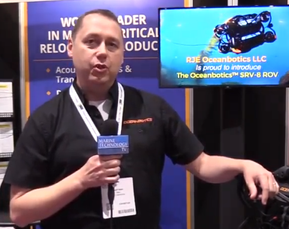 The sonar saves hours of search time while also increasing the safety factor. Towing a side scan over an area produces a detailed map of the underwater terrain so divers know exactly what’s down there before entering the water. Even in zero visibility the images can be almost photographic quality. Some sonars also allow vertical structures to be scanned by rotating the angle of the transducers on the towfish, meaning a team can survey the face of a dam, seawall, pier, bridge support or ship’s hull to look for damage or any “unnatural” device like an explosive that may have been attached to the structure. A number of state emergency management agencies and sheriff’s departments have received homeland security grants to acquire this equipment to aid in the protection of ports and crucial infrastructure. 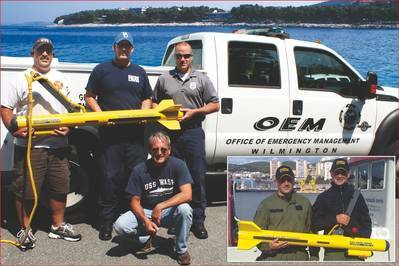 One of the agencies employing side scan sonar is Wilmington Delaware’s Office of Emergency Management. Director George Giles says the agency coordinates the efforts of all city departments to ensure a fast response in the event of an emergency. The agency’s first responders include members of both fire and police departments. They were put to the test in 2012 when Superstorm Sandy battered the U.S. east coast causing more than $68 billion in damage and claiming the lives of 268 people. Having JW Fishers SSS-100K/600K side scan allowed the team to search for missing persons, survey canals and waterways choked with debris, and inspect support structures of the many bridges crossing over waterways. Another agency using sonar for infrastructure inspection is the North Carolina Department of Transportation which has responsibilities including maintenance of the state’s 12,712 bridges. NCDOT purchased Fishers SSS-600K with adjustable transducers, which makes it possible for the sonar to scan vertical structures. With this capability the DOT can inspect the supports of any bridge that crosses over water, or survey an area prior to the construction of a new bridge. Owning the sonar allows the department’s engineers to perform inspections at a moment’s notice, instead of waiting for a contractor. Other key features of their system are a Splashproof computer, handy to have when operating the sonar from a small open boat and mapping software which shows the track of the boat moving over the search area and the swath being scanned. Military units around the globe, including the U.S. Naval Explosive Ordinance Disposal Technology Division, are finding a variety of applications for side scan. The division traces its origins back to WWII when there was an urgent need for countering advanced weapons systems of other nations. Current global events and evolving threats have reemphasized the importance of their mission for homeland defense and our ongoing military efforts. EOD technicians are deployed worldwide and tasked with neutralizing unexploded ordnance of any kind. Countering these threats requires they have quick reliable access to a broad range of tools and information. NAVEODTECHDIV determines which equipment and procedures are most effective for ordnance location and disposal. One instrument identified as extremely useful is side scan sonar, and the division purchased several of JW Fishers SSS-600K sonar systems for this work. The 600K can scan a swath up to 150 meters with each pass of the boat and provides the high resolution necessary to identify small objects on the bottom, or in the water column. A number of European military units have also purchased Fishers side scans for similar operations. A few of the many other teams using Fishers side scan sonars are Dong Huan Firefighting Company in China, Yell County Office of Emergency Management in Arkansas, Placer County Sheriffs Dept in California, the Brazilian Navy, the Rockland County Sheriff’s Office in N.Y., Union Fire Company in Pennsylvania, Livingston Parish Office of Homeland Security in Louisiana, Argentina’s Perfectura Naval - similar to U.S. Coast Guard, Wheeling Police Dept in West Virginia, Miami-Dade Police Recovery Unit and Franklin County Sheriffs Dept in Florida.